Police are seeking to identify a man who placed raw bacon on the door handles of a Las Vegas mosque, an apparent hate crime that was recorded by surveillance cameras. According to cops, the defacement of the Masjid Tawheed mosque occurred around 3:15 AM Sunday. Video captured a man first placing bacon on the handle of the mosque’s rear door. 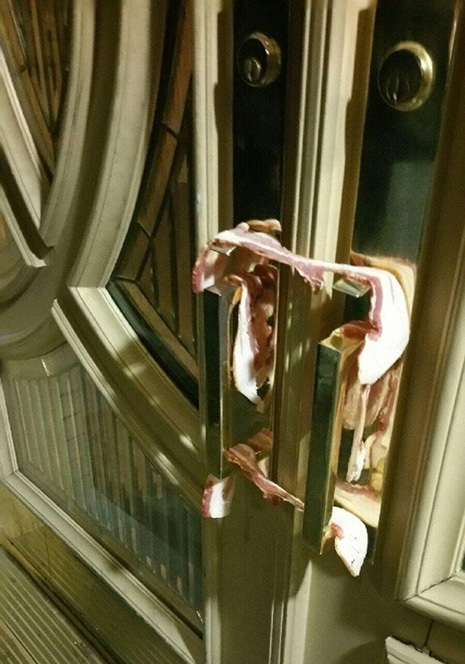 The vandal then walked to the mosque’s main entrance and stringed several pieces of bacon across the front door handles (as seen in the adjacent photo). The bacon was discovered hours later by worshipers arriving at the mosque for early morning prayers. Muslims are prohibited from touching or consuming bacon and other pork products. Based on surveillance video, the suspect, who wore a baseball cap and glasses, appears to be a white male with a mustache, goatee, and long sideburns. It is unclear how he arrived at the mosque in Spring Valley, a town two miles from the Las Vegas Strip. In April, an Oklahoma mosque reported to cops that “someone put uncooked bacon on the door handles of the men's and women's mosques” on a Sunday morning. No arrests have been made in connection with the incident at the Islamic Society of Edmond. Human Humidor, 20, Stars In Latest Installment Of "She Hid What Where?"